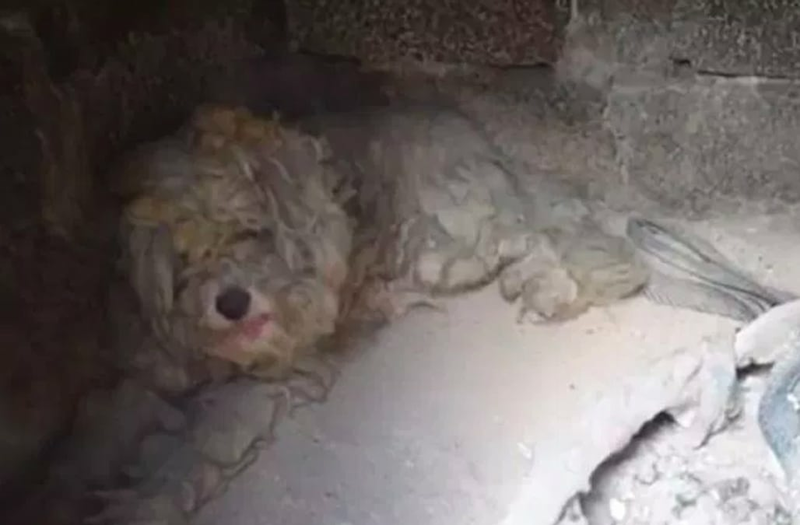 A poodle mutt survived a devastating fire in Greece by hiding in an outdoor oven, authorities said. The traumatized pooch was cowering in the corner, his white coat singed yellow and matted with ash. It took hours to coax him from the burned-out oven, despite using enticing delights such as food and water. He was discovered one week after a horrific wildfire destroyed the seaside resort of Mati, killing 91 people and creating an inferno so intensely hot that car windows and bumpers melted, authorities said. Officials say arson was to blame. Animal rescuer Artemis Kyriakopoulou was searching the devastated, lunar-looking landscape when she came upon the outdoor oven. "I figured if anything were alive, it would be in there," she said, according to the Greek City Times. "It's so sad because we haven't been able to find an owner — unfortunately, the owner may have died in the fire. I am soon heading back to Mati to look for more animals that might have survived," she said. Hundreds of animals are believed to have perished in last week's blaze and 25 people remain missing. The fast-moving fire tore through the oceanfront village filled with retirees and vacation homes. Poor architectural planning turned the town just outside Athens into a deathtrap with few exit routes, authorities said. Many residents were driven by flames and smoke into the sea, where they pulled shirts and scarves over their mouths and noses and waited out the firestorm. The lucky pup survivor was taken to a vet, who christened him Loukoumaki, which, roughly translated, means "sweet treat." After an exam, a bath and a good shave, Loukoumaki seemed fine. He is slowly recovering with antibiotics and is living with Diana Topali, a foster host, until a permanent home can be found. The dog is thought to be a stray and is about 4 years old. "Even its eyelashes are burned. I wonder how this dog survived," said Topali. "He just looked like a burned,shaggy rug."